A few weeks ago, I wrote about my strategy for getting “back into the studio” with 20 minutes of stitching each day. When the universe saw fit to change my plans the past few weeks, I decided I needed to Keep Stitching! My “plan” to take part in the Silhouette Curio Intensive retreat turned into an emergency trip to Chapala to take care of business for our condo association. My return was delayed when I picked up a nasty tummy bug. I had to cancel my lecture for the South Minneapolis quilt guild because I couldn’t be on a flight and in the doctor’s office at the same time, and I spent my birthday in airports instead of at home with my sweetheart. While I missed a couple of days, I made it a point to Keep Stitching – just to do something normal in the midst of the craziness. Here’s my progress update. 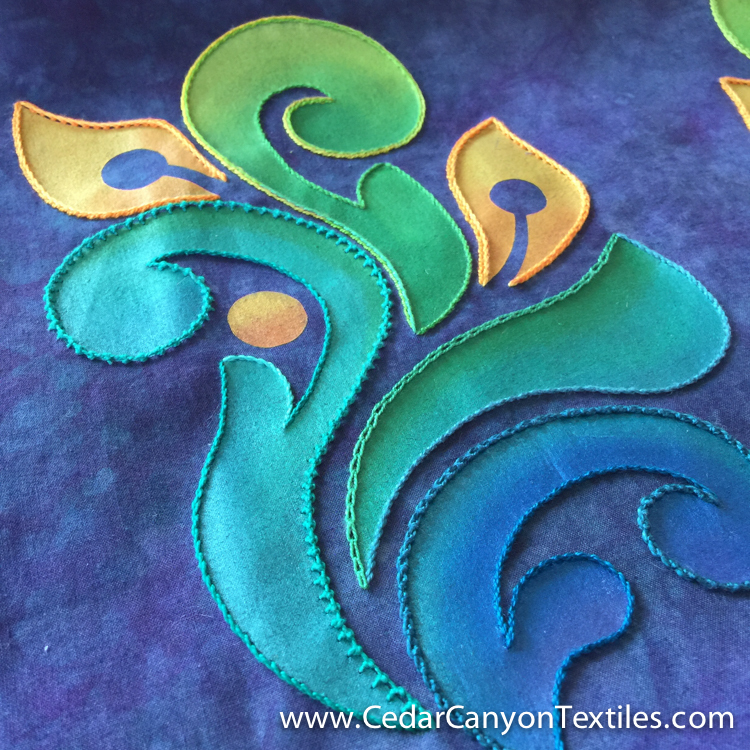 … and variegated threads on the second flourish. My first impression is that I prefer the threads with less color and value variation for a design this size. It will be interesting to see how it looks after the beads are added. 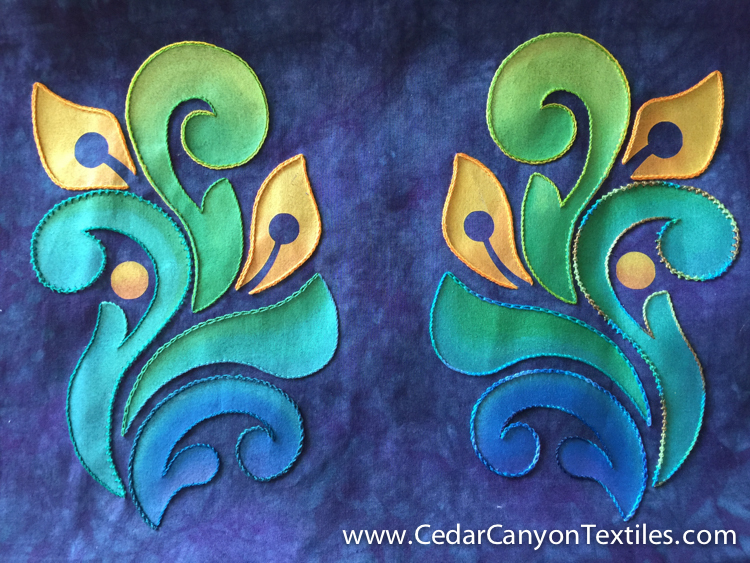 Here are the two flourish designs side by side. Both look good, and I’ll reserve judgement on the thread colors for now. 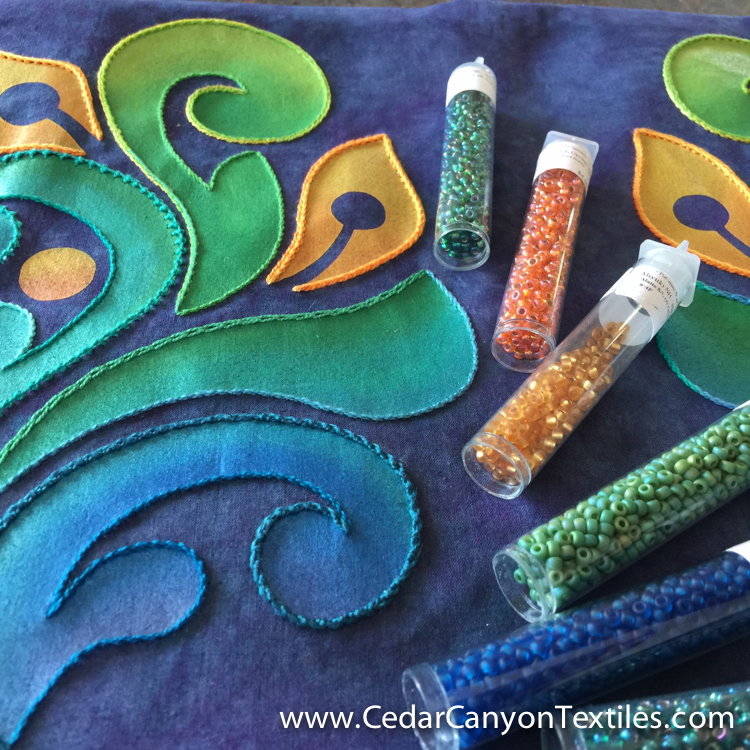 With the stitching (nearly) complete, it’s time to Keep Stitching – with beads! I’ll use the techniques I’ve developed over the past year to add some bling to my Flourish experiment. As for that batch of lemons that life sent my way… Well, that’s life. As always, we do what we’ve got to do – and do our best to make some lemonade. I’m happy I was able to help my friends in Chapala. I’m sad that I missed my program with the Minneapolis quilters and the Silhouette retreat. But in the big scheme of things, it’s all good. Do you have a creative habit that keeps you sane when life upends your plans? 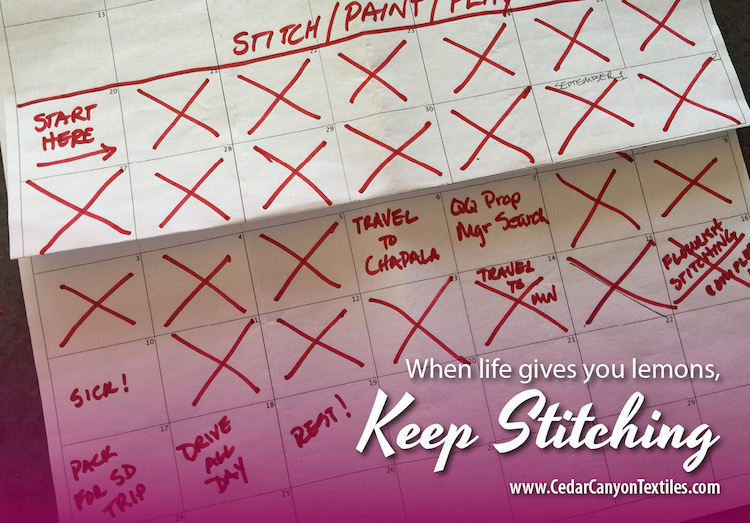 What’s your “keep stitching” equivalent? Leave a comment below. I’d love to hear from you. Get some rest, it sounds like you need it! Shelly, what is the name of the pretty embroidery stitch that looks like it has a knot on it in the first picture. The knot looks like it forms a small picot. It is on the bigger flourish with the unfinished dot. I love that stitch. I think, at this point, I like the non-variegated thread better, but who knows, after the beads are added it could change things dramatically! When life hands me lemons (and it happens to all of us), I try to keeping putting one foot in front of the other. If I give in to unpleasant things that happen, I get depressed and I really don’t like that feeling. I think God has a plan for me, and throws a few challenges in once in a while to see if I am keeping up! Sometimes I’m lagging a bit, but usually I am up for the challenge. Helps build your strength and character for bigger challenges in life! Thanks for your note, Patty. Everyday at the ranch is restful in some way. The wide open spaces and the wind in the pines are incredibly soothing. I have been following your hand stitching beading projects for awhile now, and I am wondering if you would consider doing a class on the stitching and beading. I have saved all of your explanations when you have written anything up in your blog. 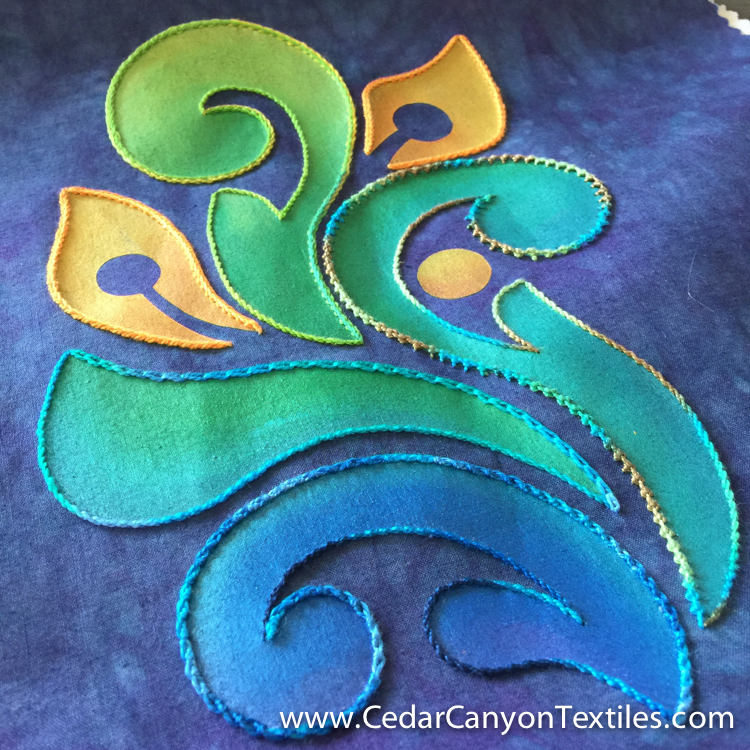 Your classes are always so incredibly thorough and detailed that I would love to have a class with you on your stitches and the ingenious way you have developed to add the beading. As for dealing with life’s issues, I quilt my little heart out, especially in the middle of the night when the issues keep me awake. Thanks, Linda. I’m glad that you enjoy my stitch + bead adventures. I will be turning this into some kind of learning adventure. I’m just not sure what format it will take just yet. I’ll keep you posted in the newsletter.